Plastic Tamper Resistant Mouse Poison Bait Station is a sturdy, lockable box that will hold and keep safe all of our mice poison baits to avoid spillage and access by children and pets. 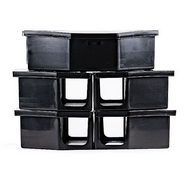 The design of these boxes encourages mice in to the bait chamber to feed on the mice poison. The lid opens with the use of a key and it snaps shut to securely lock inside the mice poison baits. On average around 4-5 Plastic Tamper Resistant Mouse Poison Bait Stations should be laid in an area where mice are present and where you want to eliminate and eradicate a rodent problem.